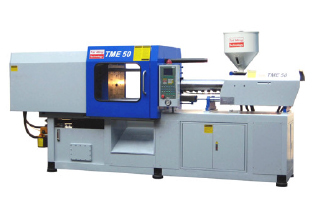 The TME Series of injection moulding machines is designed for high-speed injection, the moulding of frames, precision moulding, low power consumption, hot runner moulds, stack moulds, T-moulds and DSI moulds. Each models has a choice of five screew diameters to suit the needs of users. The length to diameter ratios of the screws are made from steel plate. Two-component moulding without the use of rotary table is an option. High-speed injection is needed to fill thin-wall parts completely. The smallest three models have injection speed above 10 cm/s. The bigger models could be upgraded with the turbo pump option to reach this speed. To cater to the high pump flow rate, big diameter hydraulic pipes and fittings are used. For injection speed up to 60 cm/s, accumulator(s) couyld be added as an option. 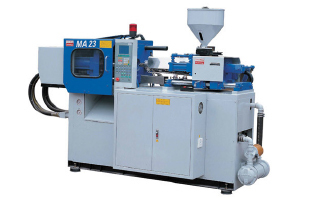 Alternativrly, the Acc series of injection moulding machines could be considered. A frame is characterized by big size but with empty space inside. The LCD frame or the cloth hanger are examples. These parts do not need a lot of clearence between tiebars. For a given clamping force, the TME clearance between tiebars is comparable to that of European machine. The standard TME machine has open loop control. Higher precision moulding could be done by selecting 1/4, 1/2, 3/4 and fully closed loop control option has 4/4-closed loop control. The standard TME model uses the energy-saving variable displacement pump. Its saves on power especially during the long holding pressure and cooling time characteristic of thick-wall parts. The servomotor option saves even more energy. The Yuken servomotor drives a variable displacement pump so high and low displacement could be dynamically chosen. the low displacement is used during holding pressure to reduce the loading to the servomotor, a feat even a fully electric machine could not do. When no motion is required , the servomotor stops turning so the machine is also quite. The energy saving ability is comparable to that of a fully electric machine which has at least four servomotors but does not use any pump. Induction heating generates power within the barrel steel material and the induction coil is not hot, the heat loss to the atmosphere is reduced. It is an option. Recently, engineering plastics has become popular. To cater to the needs of today, the ME series, which has been proven for over ten years, has been redesigned. The new design reduces the stress due to bending. This reduces the probability of breakage. About 70% of injection moulding machine problems are related to contamined oil. Returns line filter is used to reduce machine downtime. Energy consumption culd be reduced during periods of low or no flow, especially in holding pressure time for thick wall moulding, cooling time afterplasticizing is over and safety gate open and close time in semi-automatic peration. Fixed displacement pump in an option. Engineering plastics have high viscosity which needs high injection pressure to overcome. The B screws have injection pressure above 1500 kg/cm2. Screw length is measured by the lenght to diameter ratio. The B screw has an L/D ratio of 22, that of the A screw is 24. Colour and temperature are more even with a long screw. To cater to the needs of moulders, Tat Ming has designed screws for moulding PC/PMMA, nylon, POM, LCP and PVC. The PC/PMMA screw has a low compression ratio to reduce the temperature o verride in mid-barrel so the yellowing problem is solved. On the other hand, the nylon screw has a high compression ratio. Rigid PVC is highly temperature sensitive. Air blow cooling keep barrel temperature overshoot to within 2 deg C. This solves the burnt PVC ploblem and the welding line problem common in PVC moulding. To assure you of our quality, we have a 2-year warranty on tiebars, platens and toggle pins and bushings. Tat Ming Technology introduced the MA series two-platen compact injection moulding machine in 2000. The MA 18 is general-purpose. The MA 23 is for thin_wall moulding. MA 21 is designed for micromoulding. its injection speed is very high and also suits thin-wall moulding. The campling unite uses the two-cylinder direct hydraulic design, so the two tiebars are always equally stretched. As a result, the platens and the tiebars are guaranteed not to break. Clearance between tiebars and opening stroke are both at 270 mm which are no smaller than similar machines from abroad. There are three choice of screw diameters, all at a length to diameters (L/D) ratio of no less than 22. Other than the general-purpose screwa, there are screws designed for POM, PMMA/PC, LCP and PA66 (nylon) for your selection. Temperature control uses the PID algorithm and solid state relays. Water collar temperature is monitored. Back pressure is indicated on a gauge. So is clamp pressure. Proportional back pressure control is an option. The injection unit could swivel toward the back for easy maintenance. The hydraulic circuit is designed to increase speed and reduce response time, in tune with the customer's expectation of a compact machine. High speed directional valves and cartridge valves used. The injection valve is close to the injection cylinder to improve speed of response. The speed booster increases mould closing speed by almost ten times. When injection moulding watch components, cycles time could be as low 4 seconds when pneumatic ejection is used. Pressure and flow could be ramped up or down to reduce shock and vibration. The injection status is displayed on the LCD screen of the operator's panel. Injection, mould position and ejection are measured by potentiometers. Variable displace ment pump is an option to reduce power consumption, especially when moulding thick PC parts wich involves high holding pressure and long holding and cooling time. Variable displacement pump allow a very low injection speed, suitable in moulding optical lenses. The servo motor system saves even more power than variable displacement pump and has faster response, Pressure is closed loop conrolled, so product stabillity is improved. We recommend this option for moulding optical lenses. The semi-closed loop hydraulics option (-P) reduces the hysterisis of the proportional valves and improves their speed of response. The closed loop variable displacement pump option (-VP) gives even higher precision as pressure control is fully closed loop. This is known as 3/4-closed loop. It is recommended for precision (repeatable) moulding where dimensional tolerance is tight. To reduce cycle time, a turbo pump could be chosen (-F). The fixed displacement turbo pump increases flow rate by 40%. The variable displacement pump increases flow rate y 70%. There is also a choice between open loop (-V) and 3/4-closed loop (-VP) variable displacement pump. Select the 3/4- closed loop version for precision moulding. The accumulator assisted injection option is available for the MA 21 and MA 23. Injection speed is a high as 600 mm/s. The two models differ in clamping force, injection speed and pressure, screw speed and torque and system pressure. Due to its higher injecton speed, MA 23 is suited to thin-wall moulding. Where very low back pressure is needed, MA 23 is also the choice. The PET series of injection moulding machines and out-of-the-mould cooling robot arms from Tat Ming are tailor made to making PET and PP preforms large and small. the machine screw diameter is big to give sufficient shot weight. The screw is also long, having a length to diameter ratio of 24 to 26. Coupled with a barrier (double screw flight) design, the plasticizing capacity of the barrel heaters. The seven models in the PET series cover a PET shot weight from 394g to 4,253g. The number of cavities is up to 72. THe largest four models could be used with robot takcout arms which redue the cycle time. In this case, the holding pressure device can be used to start plasticizing when the holding pressure starts. PP bottles have the advantage of hot fill. PP preforms could also be injection moulded using the PET series. 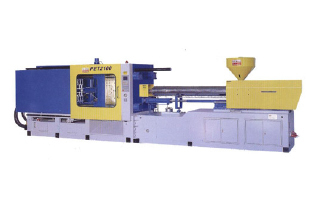 In fact, the PET series is suited to general (non-preform) moulding applications requiring high shot weight. 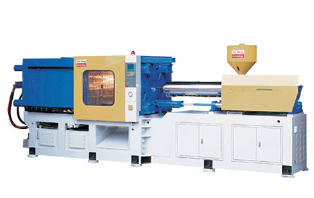 The CAP series of injection moulding machines is designed for the manufacture of bottle caps and other thin-wall products like disposable cups and utensils. Such products require high plasticizing capacity, high injection speed, short cycle time, high ejection force, high repeatability and large clearance between tiebars to accommodate multi-cavity moulds. General-purpose injection moulding machines do not satisfy all the requirement. Semi-closed loop hydraulics improves response time and repeatability. The platicizibg motor has been optimized for high screw rotational speed. By the design of the clamping cylinder and the use of the regeneration valve, mould opening and closing are carried out at high speed. Ejection force is sufficient for force ejection of threaded caps. Clearance between tiebars is among the highest among Asian machines. The model nomenclature is according to the number of cavities of 30 mm caps or forks / Knives in the mould the machine can accommodate. For example, the CAP 48 could take a 48-cavity cap mould or a 48-cavity fork / knife mould. The CAP series is recommended when the mould is not partcularly fast like cooling time of 4 seconds or more. Cycle time is between 8 and 10 seconds. For fast moulds, the CAP DP is suitable. The standard model has fixed displacement pump. Energy-saving and more precise servo motor is available as an option. The CAP DP series is the dual-pump version of the CAP series. The second pump allows eject-on-the-fly, dual-pump injection and plasticizing. As a result, the injection and plasticizing speeds are about 60% higher. With a fast cap mould, cycle time has been reached on the CAP32 DP making 1.6g caps using a Gefit (Italy) mould. The CAP DP is also different from the CAP in the following ways. The A screw is an option so the L/D ratio is about 24. The electrical motor is bigger to drive the dual pumps. A braking valve is added so even fast mould protection is more sensitive. There are two carriage cylinders instead of one. The controller has a 10.4" colour LCD display. The machine frames is much stronger, so even a stack mould or T-mould could be mounted. CE certification is available, but the CE version has a different configuration. Energy-saving dual servo motor is available as an option. Stack moulds and T-moulds have more tha one parting plane which increases productivity. If shot weight is insufficient, the B or C screw could be selected. When both parting planes make the same product, the stack mould is suitable: otherwise, the T-mould is suitable. When T-mould is used, the simultaneous motion is changed from eject-on-the-fly to mould movement plus ejection (mechanical motion) during plasticizing. This will reduce cycle time by the shorter of mechanical motion time or plasticizing time. A different controller which has the T-mould programs is used. Please specify T-mould will be used when ordering.